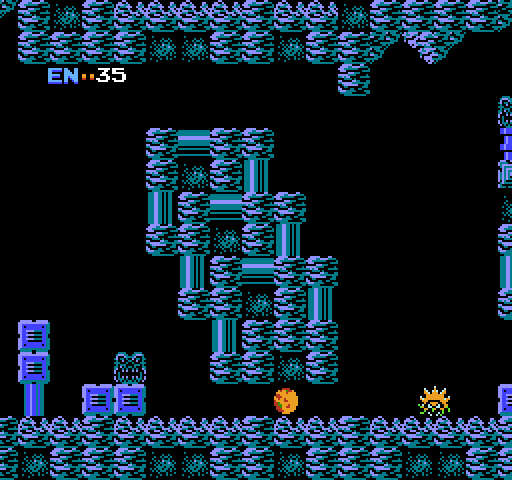 Metroid, released on the Famicom in 1986, is the first game in what has become one of Nintendo’s most successful franchises to date. 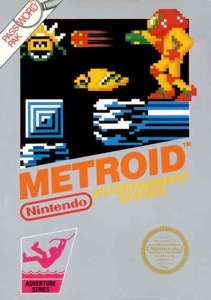 While adopting a relatively darker tone in comparison to the rest of the console’s library, the original Metroid plays as a sort of hybrid between the platforming elements of Super Mario Bros. and the exploration and item finding of The Legend of Zelda. We play as Samus, a bounty hunter hired by the Galactic Federation to prevent Space Pirates from utilising the dangerous life-form known as the Metroid. Samus flies off to Planet Zebes where she must defeat the two Space Pirate Generals Ridley and Kraid in order to access Tourian where the Mother Brain resides. In order to do that we had to traverse the lonely, labyrinth like caverns of Brinstar and Norfair and battle our way through the hundreds of monsters waiting for Samus giving us a sense of isolation that is quite gripping. The Morph Ball in action. The game begins with quite a basic Samus, the power suit she wears providing little health and not much range to her beams. However the game rewards those who are keen to explore and over the course of the mission, the protagonist gains access to longer beams, ice shots, missiles and a stronger power suit known as the Varia suit. The coolest power-up however is found right at the beginning of the game; the Morph Ball allows Samus to completely transform into ball form allowing movement and access through tight knit spaces and later on adding the ability to drop bombs. It is with this unique ability that Samus manages to stand out from the crowd of other action-adventures of the time, the game’s particular Nintendo edge as it were. However this wasn’t to be the only surprise in store for us. The fastest completion times rewarded players with this image of Samus… Somehow I think men were still the expected audience of this game. While Planet Zebes is a giant maze, full of secret passageways and power-ups to discover, the game encourages us to learn its hallways in order to attain faster clear times. Depending on how long it took us to complete the game by destroying Mother Brain, one of several endings would be unlocked. These would reveal the shocking revelation about Samus; the bounty hunter is a woman. Strangely enough the instruction manual with the game refers to Samus as male as if even the Galactic Federation made that assumption too. Nevertheless it acted as a powerful message to gamers who practically expected to be playing as a man and paved the way for more female protagonists to come in future. However not everything is grand with the original Metroid and its issues may turn a few people away from enjoying it today. This is a game that shows off a wealth of ideas and ambition from a developer that had become very comfortable with their home console system. However it seems the cartridge is unable to keep up with Nintendo’s brilliance; the game is victim to constant lag and flickering graphics. While lag is no stranger to many of Nintendo’s biggest NES releases here it is like an annoying sidekick that even Samus herself is trying to ignore. Once the screen fills with enemies, we can really feel the strain on the game when simply firing beams at them. Ultimately how much you will enjoy this game will depend on how much this issue will potentially bother you. The password system is thankfully no longer cumbersome due to the virtual console’s quick save features, but as it is an emulation of the original cartridge release, the lag remains intact and often leads to frustration where it is needed the least. There’s a great game in Metroid and it really shows how confident Nintendo had become by 1986. It has since been remade on the Game Boy Advance as Metroid: Zero Mission where it received good reviews once again. Perhaps it would be better to ultimately try out this version if you want to play the game to its full potential, but if you’re a sucker for the retro 8-bit look this is the version for you (although you can unlock it on Zero Mission also if you ever want to directly compare the two). Other than that it’s been noted that the Famicom Disk System release, while also featuring a save feature similar to The Legend of Zelda, has much less lack than its cartridge based NES counterpart. Either way Metroid is once again a stellar entry in Nintendo’s retro library. Comparison between the original Metroid (Left) and Metroid: Zero Mission (right). If you’re interested in the speed run element of the game then check out this world record play through. I remember completing it time and time again as a kid. Now that I’m an adult, trying to play it just feels too time consuming. Like you said at the end, its good to try out Zero Mission 🙂 Thats just a much smoother experience. I’m hoping to try out Metroid: Zero Mission when I get the chance. I just got too frustrated by the end of this one. Fighting Mother Brain was just wasn’t enjoyable considering how much the game struggled with everything on screen. Glad to hear Zero Mission is much smoother.